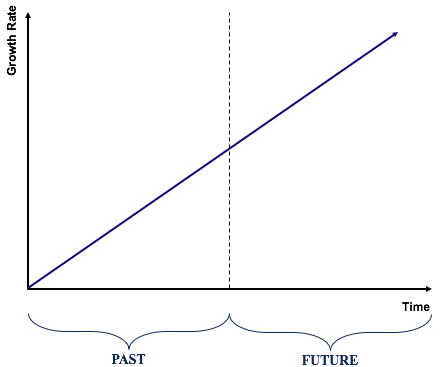 "The future will be like the past"
Durability bias is the subconscious inclination to forecast past events or occurrences forward to the future. In other words, durability is a type of cognitive biasCognitive BiasA cognitive bias is an error in cognition that arises in a person’s line of reasoning when making a decision is flawed because of their personal beliefs. Cognitive errors play a major role in behavioral finance theory with the assumption that past trends will continue into the future. The term durability bias is commonly used in behavioral financeBehavioral FinanceBehavioral finance is the study of the influence of psychology on the behavior of investors or financial practitioners. It also includes the subsequent effects on the markets. It focuses on the fact that investors are not always rational and forecasting. The durability bias can have a significantly adverse effect on decision-making for investors. To illustrate the point, imagine an investor who believes a company that has regularly outperformed analyst estimates for Earnings per Share (EPS)Earnings Per Share (EPS)Earnings per share (EPS) is a key metric used to determine the profit for the common shareholder's on a per share basis. Earnings per share measure each common share’s profit allocation in relation to the company’s total profit and can be calculated based on basic shares outstanding or fully diluted shares outstanding will continue to do so indefinitely. Imagine then that the competitive landscape in an industry changes, and the company doesn’t alter its business modelIB Pitchbook - Business Model, Forecast, OwnershipEvery company's business model is unique, and their execution of key activities is how a company derives its competitive advantage. It is imperative that an investment banker gains a strong understanding of the business, how it in response. Over time this company would start underperforming and prove to be a bad investment. In this example, using the past as a reference for the future was not a good idea. Instead, an investor should look forward to what may happen in the future, independent of the past. US marketsDow Jones Industrial Average (DJIA)The Dow Jones Industrial Average (DJIA), also commonly referred to as "the Dow Jones” or simply "the Dow", is one of the most popular and widely-recognized stock market indices are seeing significant growth, with stocks yielding unprecedented returns due to a booming market and expanding economyMarket EconomyMarket economy definition - a pure market economy is an economic system where there are no regulations and players are free to trade as they please. John is a retail investor and current business student who recently took an interest in investing. He notices the impressive gains in a stock called “CFIAboutCFI - Corporate Finance Institute® - is a global leader in online finance courses and certifications in financial modeling, valuation, financial analysis,” which has seen a price surge of 15% year-over-year. John concludes that if he invests $10,000 in the stock today, given the year-over-yearYoY (Year over Year)YoY stands for Year over Year and is a type of financial analysis that's useful when comparing time series data. Analysts are able to deduce changes in the quantity or quality of certain business aspects with YoY analysis. In finance, investors usually compare the performance of financial instruments on gain of 15% on the stock, he will end up with $20,000 in five years’ time. In the example above, John is exhibiting durability bias. He assumes that since the stock of CFI has seen a gain of 15% yearly, it will continue to do so into the foreseeable future. The truth is that the past performance of the stock is not necessarily indicative of future performance. Founded in 1985, Blockbuster was one of the most iconic brands in the video rental space. Blockbuster, at its peak, employed over 84,000 people worldwide and boasted over 9,000 stores. The company, blindsided by its success in the video rental space, failed to transition towards a digital business model and filed for bankruptcy in 2010. Ironically, Netflix approached Blockbuster in 2000 with an offer to sell their company for US$50 million. However, the CEOCEOA CEO, short for Chief Executive Officer, is the highest-ranking individual in a company or organization. The CEO is responsible for the overall success of an organization and for making top-level managerial decisions. Read a job description of Blockbuster thought that Netflix was a very small niche business. Today, Netflix counts over 100 million subscribers worldwide with revenue upwards of $9 billion. Founded in 1957, Toys R Us was a world-renowned toy store chain. In the early 2000’s, Toys R Us was doing extremely well in its brick-and-mortar stores. But even with the emergence of e-commerce companies such as Amazon, Toys R Us decided to stick to its traditional business model and not pursue an e-commerce presence. Toys R Us missed the opportunity to build up its own e-commerce platform, and as a result, the company filed for bankruptcy in September 2017. Durability bias can exert an adverse influence on both investors and businesses. Companies and individuals who are able to avoid the durability bias constantly question future growth rate assumptions. Companies that are caught up in the durability bias and do not alter their business models in a changing environment are subject to failing. Thank you for reading CFI’s explanation of Durability Bias. CFI is the official provider of the Financial Modeling and Valuation Analyst (FMVA)™FMVA™ CertificationThe Financial Modeling & Valueation Analyst (FMVA)™ accreditation is a global standard for financial analysts that covers finance, accounting, financial modeling, valuation, budgeting, forecasting, presentations, and strategy. certification program, designed to transform anyone into a world-class financial analyst. Confirmation BiasConfirmation BiasConfirmation bias is the tendency of people to pay close attention to information that confirms their belief and ignore information that contradicts it. This is a type of bias in behavioral finance that limits our ability to make objective decisions. Narrative FallacyNarrative FallacyOne of the limits to our ability to evaluate information objectively is what’s called the narrative fallacy. We love stories and we let our preference for a good story cloud the facts and our ability to make rational decisions. This is an important concept in behavioral finance.